Why you shouldn’t put a coat on your baby in the car seat. Baby, it’s cold outside. The polar vortex has come and gone. We are in winter. Now “cold” is relative. I know some of you bundle up when it dips below 50 degrees F. I know some of you are like me and still don’t wear a coat when it is 3 degrees F. But no matter the exact temperature, we are all cold. Except some of you in special parts of the world but for my winter sanity, we will pretend your climate does not exist unless I am headed there for a vacay. But cold or not, life (typically) goes on. We still need groceries. Kids still have school. You still paid for that dance class. So you need to leave the house. And if you have a child in a car seat, you will be driving with that child in the car seat. And it is cold so like any good responsible person, you put a coat on your child. And here is where we pause. 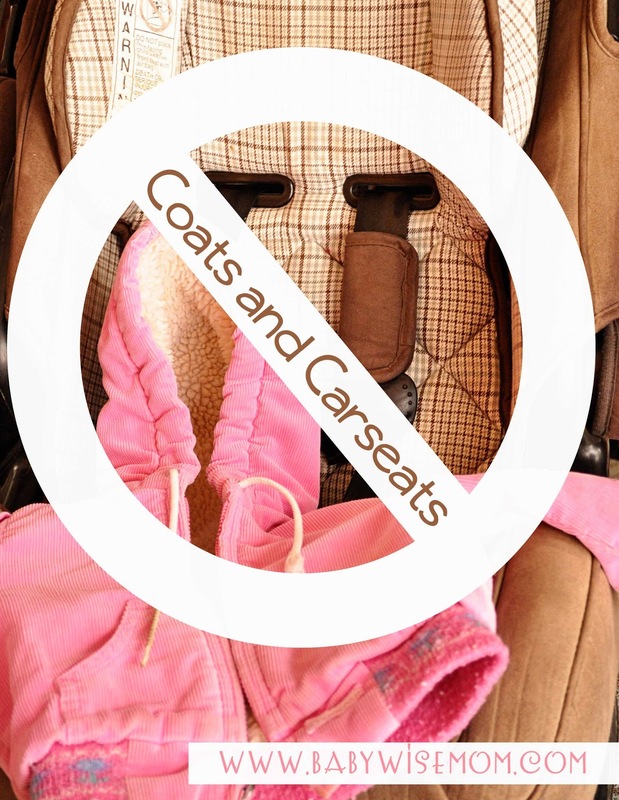 Most items that are actually classified as a “coat” CAN NOT be on your child while your child is buckled in the car seat. I know some of you know this. If you do, feel happy this is being shared to a large audience. Go ahead and share it to help spread the word. Some of you, however, do not know this. A child can not wear a coat in a car seat. Yes I know it. Guess what, where I live it is pretty normal to dip below zero throughout much of the winter at night and we usually have some snap where we are under zero for the high even in the day for about two weeks. So yes, I know what it is like to be out and about in the cold with the little ones. But the big coats that seem like the right thing to wear in the frigid weather are not safe in the car seat. So what do we real parents living in the real cold world do about it? Consumer Reports suggests figuring out what coats can be worn. You do this by putting the child in the coat, adjusting the straps, then taking the child out of the seat and out of the coat and putting the child back in the seat and see if it passes the pinch test (if you can pinch the straps, it isn’t safe). I think that is a great idea, but I think I have an easier way. Put your child in the coat. Put your child in the seat. If you need to loosen the straps to get your child buckled in, the coat is too big. Back to being real people who really have to go out in the cold. How do you keep your child warm without being able to use the nice big coat? I am a minimalist when I am running errands. Each week when Brinley and I run errands together, she and I both go without our coats. We get into our vehicle that is parked in our garage so it takes about two minutes at most for the engine to be warm enough for the heater to warm us up. Then we get to the store and have to walk for maybe a minute to get into the heated store. So I could stand there in the cold for two minutes while I put a coat on her or I can grab her and walk inside. Stores are kept warmer in the winter than they are in the summer (when the air conditioning is blasting you back into January memories) and we are dressed way warmer than we are in the summer, so we don’t need our coats in the store. But maybe you don’t like the minimalist approach. Here are some other ideas. Strap before you wrap. No matter what you want to use to keep your child warm, you want to strap your child into the seat before you add anything warm. Blankets. Use blankets in the car to warm up. I love blankets for longer car rides because those who like to be warmer (me) can bundle up and those who like to be cooler (my husband) can ignore the blankets. You can also use a blanket to wrap around younger children as you carry them into the store. This is nice if it is windy outside–cold plus wind is a whole different game than just cold. But even with wind, spending as much time standing in the cold putting a coat on as it does to walk into the store doesn’t make sense. So you can wrap a blanket around your child and carry her in all snuggled up to you. You can keep a blanket in the car at all times so you don’t have to remember to pack it each time you go out. Backwards coats. Did you ever wear your coat backward in Jr. High or High School? For some reason, I did it all the time! You can strap your child in and then put their arms in the coat arms. This is handy for when you are driving somewhere where you need a coat on. Snuggies. Merge the two ideas and get everyone a snuggie! Okay, those poor blankets are laughed at by many, but my grandpa got us a couple and my mother-in-law got each of the kids one a couple of years ago and sometimes they really are nice! (though I still think you could use a backward robe instead). Hats. A lot of warmth is lost through the head, so a nice warm hat can do a lot for keeping your child warm. What is your approach for running errands in the cold with children? How do you keep your kids warm in the car? I do a hat and a blanket in the car, and a blanket if we're running in to the store. For school drop-offs I have a stroller "bag" that is like a sleeping bag that stays in the stroller all the time. I pop her in there and zip up the bag and she's all set. I have a coat in the car for her, but I rarely use it. I did not know this shamefully. Thank you! Seriously? I have NEVER heard this. Why don't doctors tell us? I didn't know this for my first couple of kids either. I am not sure why we don't get told–I am not even sure whose job it would be to pass the word along. I would guess doctors don't because it isn't necessarily health related. At least the word is getting out now! The Car Seat takes the hassle out of care your child protected and hot in the car seat.Car service provides a secure, undercover and organized atmosphere for Travellers. Many thanks a whole lot regarding expressing this kind of article. What about cloth diapers? I go back and forth sometimes and when I use a disposable, I have to tighten the straps because cloth are more bulky. So does this mean than I should not be loosening the straps for cloth diapers in the first place? That is a good question! I never thought of that before. I would say you most likely should not loosen if you can. Slight variation on the "no coat" and blanket options. Cut a slit roughly 12" long diagonally in the middle of a fleece blanket. Instant poncho! You can cover them with the blanket while in the car, then if getting them out of the car seat, pop it over their head, no sleeves, mittens or blanket falling off. What about a sleep bag? We use this quite often in the car. It has a built in hole for the buckle so I can't see that it would be possible to slip out right?